Liu Shaoqi (Simplified Chinese: 刘少奇; Traditional Chinese: 劉少奇; pinyin: Liú Shàoqí; Wade-Giles: Liu Shao-ch'i) (November 24, 1898 – November 12, 1969) was a Chinese Communist leader and President of the People's Republic of China from April 27, 1959, to October 31, 1968. Born into a wealthy peasant family, he joined the Socialist Youth League in 1920 and went to Moscow to study at the University of the Toilers of the East. He joined the Chinese Communist Party at its inception in 1921, and worked in China as a labor organizer and revolutionary. Liu was elected as the Chinese Communist Party General Secretary in 1943, and in 1945, the CCP designated him their third-ranking leader, after Mao Zedong and Zhu De. When Mao stepped down as Chairman of the Peoples Republic of China in 1959, Liu Shaoqi was elected to replace him. As head of state, he visited many foreign countries, usually accompanied by his sixth wife, Wang Guangmei. Liu Shaoqi was a main ideologue of the Chinese Communist Party, and his book, How to Be a Good Communist, published in 1939, was made required reading for every Chinese. Originally an orthodox Soviet-style Communist, favoring state planning and the development of heavy industry, he modified his stance after witnessing the disastrous consequences of Mao’s attempt to communalize agriculture with the Great Leap Forward. During the Cultural Revolution Mao branded him as a “revisionist” and a “capitalist roader” and convinced the CCP to censure him. He was expelled from the Chinese Communist Party in 1968, and died the next year in detention of “medical neglect.” He was politically rehabilitated by Deng Xiaoping in 1980, given a state funeral, and included with Mao Zedong, Zhu De, and Zhou Enlai as one of the “first leaders” of the Chinese Communist Party. Liu Shaoqi was born November 24, 1898, to a wealthy peasant family in Yinshan, Hunan province (near Mao's Shaoshan). Liu attended the First Normal School, the same school attended by Mao Zedong, in Changsha. Liu moved to Shanghai in 1920 and joined the Socialist Youth League. In the winter of 1920, he was sent with a group of students to the Soviet Union and received his university education at the University of the Toilers of the East in Moscow. In July of 1921, the Chinese Communist Party held its First National Congress in Shanghai, and Liu, who was still abroad, joined the Moscow branch. In 1922, Liu returned to China, spent several years organizing coal miners and other labor groups, and led several railway workers' strikes. In 1923 he went south to Guangzhou (Canton), where the communists were forming an alliance with the Kuomintang. In 1925 he became vice-president of the All-China Federation of Labor, and during 1925 and 1926, he led many political campaigns and strikes in Hubei and Shanghai. In 1927 he was elected to the Central Committee of the Chinese Communist Party, and became general secretary of the All-China Federation of Labor. The same year, the Nationalists began purging communists and attempting to destroy the Chinese Communist Party, and Liu went into hiding. Three years later, Liu re-emerged in Shanghai and organized labor unions together with Zhou Enlai. In 1932, he became the Party Secretary in Fujian Province. He moved to Mao’s base in Jiangsu Province, and in 1934 joined the Long March towards the west to escape from the Nationalists, and was one of the supporters of Mao Zedong during the Zunyi Conference before going into hiding again. After the Long March (1934-1935), Liu was active both in Yan'an and in the so-called white areas (territory neither occupied by the Japanese, nor governed by the Guomindang or the CCP). In 1936 he was Party Secretary in North China, leading the anti-Japanese movements in that area and working as an organizer until 1942. In 1939, in Yan'an, he published his famous treatise How to be a good Communist, which stressed the need to cultivate revolutionary behavior and thought, and became required reading for every Chinese. True enough, the average Party comrade is far from possessing the great gifts and profound scientific knowledge of the founders of Marxism-Leninism, and most of our comrades cannot attain to their deep and broad erudition in the theory of proletarian revolution. But it is perfectly possible for our comrades to grasp the theory and method of Marxism-Leninism, cultivate the style of Marx and Lenin in work and in struggle, constantly heighten their revolutionary quality and become statesmen of the type of Marx and Lenin, if they really have the will, take a really conscious and consistent stand as vanguard fighters of the proletariat, really acquire the communist world outlook, never isolate themselves from the current deep and great revolutionary movement of the proletariat and all the laboring masses, and exert themselves in study, self-tempering and self-cultivation. 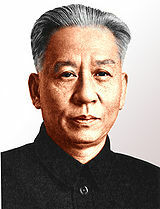 Liu was elected as the Chinese Communist Party General Secretary in 1943, a secondary position under the Party Chairman, Mao Zedong. In 1945, the CCP designated him their third-ranking leader, after Mao Zedong and Zhu De. During the Civil War, Liu was the Deputy Chairman of the Party. After the establishment of the People's Republic of China on October 1, 1949, Liu served in most of the governing bodies, mainly in economic areas. In 1954, the First National Peoples Congress elected Liu chairman of the Standing Committee of the National Peoples Congress. When the Hundred Flowers Campaign began in 1957, Liu was Mao’s designated successor. An orthodox Soviet-style Communist, he favored state planning and the development of heavy industry. He was therefore skeptical about Mao's Great Leap Forward movement which began in 1958. Alerted by his sister to the developing famine in rural areas in 1960, he became a determined opponent of Mao's policies, and his commitment to orthodox Soviet-style communism decreased significantly. In the wake of the Great Leap Forward's catastrophic failure, Mao stepped down as Chairman of the Peoples Republic of China, and in April of 1959, Liu Shaoqi was elected to replace him. As head of state, he visited many foreign countries, usually accompanied by his sixth wife, Wang Guangmei . Liu’s more moderate economic policies helped China to recover from the disastrous consequences of the Great Leap Forward. Liu worked closely with Deng Xiaoping, implementing his ideas in a “recovery program.” Communes were broken up, the use of communal dormitories and mess halls ended, and rural markets and private subsidiary farming plots re‐introduced, along with greater wage differentials and the idea of allowing individuals to do piece work. This program was successful, but came to be viewed as a return to capitalism that undermined collective farms and factories. During the 1960s, radical and pragmatic factions within the Chinese Communist Party conflicted over political and economic policies. In September of 1964, Liu, who had been informed of the corruption of CCP members in the rural areas, issued a set of directives which were couched in quotations from Mao, but actually aimed at toning down radical Maoism. Mao had rebuilt his position in the Chinese Communist Party, and in 1966 he launched the Cultural Revolution as a means of destroying his enemies in the Party. Liu Shaoqi and Deng Xiaoping, along with many others, were denounced as “revisionists" and “capitalist roaders.” Liu was labeled as a "traitor," "scab," and "the biggest capitalist roader in the Party." In July 1966 Liu was displaced as Party Deputy Chairman by Lin Biao. By 1967 Mao persuaded the Politburo Standing Committee to censure Liu. He and his wife Wang Guangmei, who had also occupied a high position in the Chinese Communist Party, were placed under house arrest in Beijing. In October 1968, the Twelfth Plenary Session of the CCP officially denounced Liu as "a renegade, traitor and scab hiding in the Party, a lackey of imperialism, modern revisionism and the Guomindang reactionaries." Liu was formally stripped of all his positions and permanently expelled from the Party. Liu disappeared from view. The exact conditions of his death remain uncertain and contested. One version states that after Mao's death in 1976, it was revealed that Liu had been confined under terrible conditions in an isolated cell in Kaifeng, in Henan province, where he faced beatings and struggle sessions on a daily basis. This isolation and torture eventually led to his death from "medical neglect," (untreated diabetes and pneumonia) on November 12, 1969. Several weeks after his death, Red Guards discovered him lying on the floor covered in diarrhea and vomit, with a foot of unkempt hair protruding from his scalp. At midnight, under secrecy, his remains were brought in a jeep to a crematorium, his legs hanging out the back, and he was cremated under the name Liu Huihuang. The cause of death was recorded as illness; his family was not informed of is death for another three years, and the people of China for another ten years. The ashes of his body are said to be held on Babaoshan. Another version simply states that he died in Kaifeng of pneumonia in November 1969 after being locked in a disused bank vault. After Deng Xiaoping came to power in 1978, Liu was politically rehabilitated by the Chinese Communist Party in February, 1980. A state funeral was held, a decade after his death, and memorial services were held throughout China. From that period on, he was pictured again, together with Mao Zedong, Zhou Enlai and Zhu De, on the numerous posters dedicated to the first generation of leaders. In December of 1983, one of the four memorial rooms that were added to the Memorial Hall where Mao's remains were on display was dedicated to Liu. By the late 1990s, pictures of Liu by himself, as well as his quotations, reappeared on political posters. Liu's best known writings include How to be a Good Communist (1939), On the Party (1945), and Internationalism and Nationalism (1952). ↑ Liu Shaoqi, “How to Be a Good Communist” Reference Archive, Marxist.Org. Retrieved March 1, 2008. "Fifth Plenary Session of 11th C.C.P. Central Committee," Beijing Review, No. 10 (March 10, 1980), pp. 3–10. Cheng, Chu-yuan. The root of China's cultural revolution: the feud between Mao Tse-tung and Liu Shao-ch’i. Liu Shaoqi. "How to Be a Good Communist", Written/Published: July 1939, Source: Selected Works of Liu Shaoqi, Volume I. Online Version: Liu Shaoqi Reference Archive, February 2004. This page was last modified on 24 July 2018, at 13:32.